Welcome to the July Control Freaks blog tour! This month it's "Show Us Your Swaps." We demonstrators pass a lot of cards around this time of year, and here is chance for you to see a whole bunch of them at once. So if you think about it, it's a Swap Hop! You may have arrived here from the blog of Lisa Martz. Weren't her projects awesome? No matter how you arrived, you can view every blog on the hop. At the end of this post is a button to click to go on to the next stop. Note: If you have come across this post before the 20th, please visit again tomorrow when when all the posts will be active. I have two cards for you today, and both of them feature sneak peek products from the upcoming Stampin' Up Holiday Catalog to be released August 1. 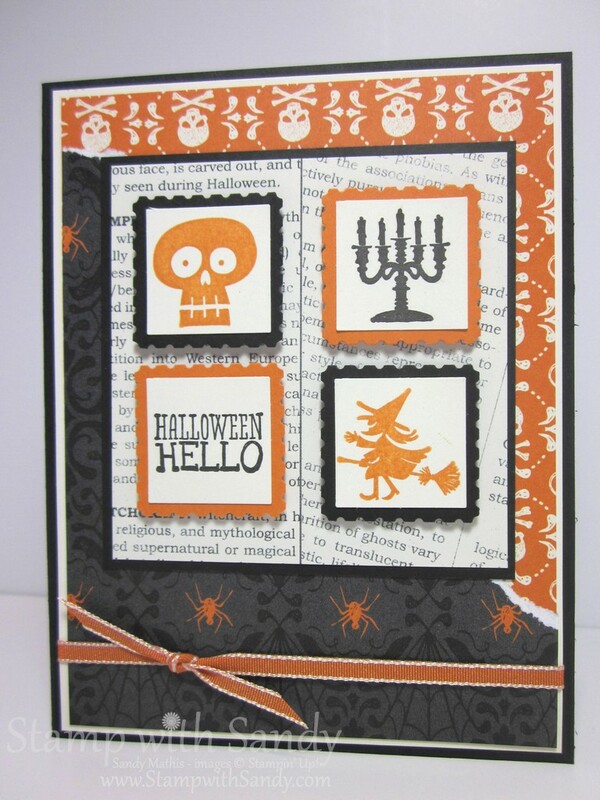 I love Halloween Sets with cute fun images, and the Halloween Hello set was one of the first on my order. Most of the images fit perfectly inside a 1" Square Punch, and I layered them on top of card stock cut with the Postage Stamp Punch. This layout made it possible for me to show off three of the patterns in the fun Witches Brew Designer Series Paper. I finished off this simple card with some Pumpkin Pie 1/8" Taffeta Ribbon. 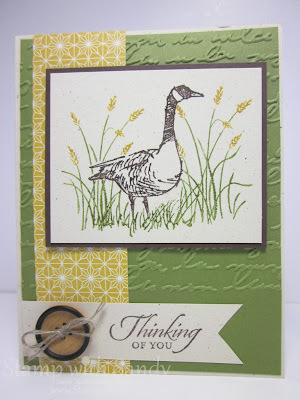 My second card features the Wetlands stamp set, combined with some sneak peek accessories. The great DSP is from the Sweater Weather pack, and the embossed background was done with the Pretty Print Embossing Folder. The stamps were colored with markers before stamping onto Naturals Ivory Card Stock. Some Linen Thread and Naturals Designer Buttons are the perfect embellishments for this autumnal card. Keep scrolling down for a full list of products used for both cards. Then, hop along to the next Control Freak on our tour, Barb Mullikin. I know Barb has some great projects to show you! *Available August 1 in the Stampin' Up 2013 Holiday Catalog. Contact me here to request a free copy. Always wowed when I happen by your little creative haven! Love both the cards but that EF with that set is gorgeous! I love your cards, Sandy! My favorite set of the moment is Wetlands so I particularly liked that card! I love the Naturals Designer Button accent! These are wonderful Sandy! The Halloween is so cute and the Wetlands one is just beautiful! Both cards are WOW...just got the Wetlands set so looking forward to playing with it! Sandy, HUGE fan of your work! So lucky to have you in my swap group! I love your Wetlands card and am thrilled to own one! Your Halloween card is wonderful, too! I wish my clients liked to "do" Halloween as the set you used is really fun! Great job on the blog tour! 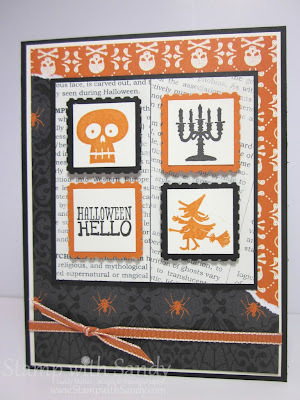 Wonderful cards, Sandy....Halloween is my favorite holiday....so love your card! And I keep thinking why should I buy the Wetlands set, but the more I see of it, the more I want it....thank you!